President Nkurunziza of Burundi is the latest leader to discover the efficacy of tear gas in maintaining political power. Burundi has been transformed from a sleepy all-but-forgotten state to a headlining destination of many of the world’s foreign correspondents. 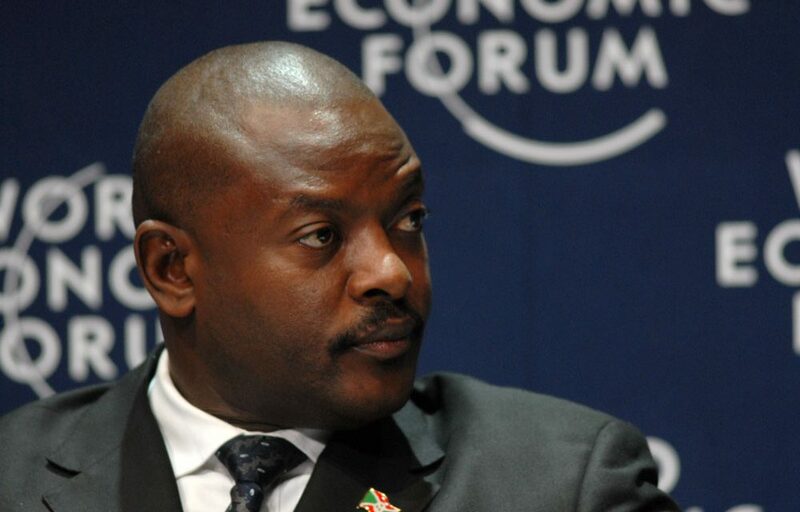 Nkurunziza has had plenty of examples to learn from. After Uganda’s last elections, in 2011, the opposition came together in a rare show of unity to protest issues long forgotten in the wake of what ensued. An enduring image of the outcome is of four opposition party leaders clinging together in a belated gesture of solidarity and plastered to the wall of Bata Shoe Shop by a powerful jet of colored water before slithering down to the pavement in a bewildered heap. They had been attempting to hold a rally in the iconic Constitutional Square, the scene of so many of Uganda’s political rallies. But it is a serious question. Most African countries are pre-industrial. Despite being the primary source of minerals, most things made of metal are imported. And while polymerization is Ordinary Level physics the majority of plastic products are also imported, used for a few months, broken and then thrown away and replaced. As with so many exasperating questions about African development, the answers are hidden in plain view. In this case, a memorandum to Henry Kissinger from Fernando Rondon, a National Security Council Staffer in January 1973. The background is that the Nixon Administration was beginning its second term and foreign relations with Africa were under review. Newly independent African states were still tied to European colonists by trade agreements they found unfavorable. The ongoing trade embargo against Rhodesia had been somewhat mitigated by the Byrd Amendment, a law passed to allow US importers to buy Rhodesian chrome, much to the annoyance of outspoken states like Nigeria. Then there was the ongoing question of Aid to Africa. In the beginning, under the Eisenhower Administration, US aid had been restricted to technical assistance, cultural programs and the PL-480 program. Under PL-480, Government bought up US agricultural surpluses, auctioned them on the open market in recipient countries, and disbursed the funds in those countries. Larger projects like the Akasombo Dam in Ghana were financed for the most part by African governments, supplemented by loans from the American Development Loan Fund. Supplementary funds came from World Bank loans underwritten by American private investors. The Kennedy Administration was more pliant and made more grants than Eisenhower. On the political scene, most of Africa had attained independence and was agitating for the independence of apartheid South Africa and the final withdrawal of Portugal from Mozambique, Angola, and Guinea Bissau, objectives the Kennedy Administration had sympathized with. Fair enough. But what did this mutual exchange entail? Immediate proposals were to organize a presidential visit to Africa, not to negotiate terms of engagement it was emphasized, but as a show of goodwill. The Byrd Amendment on Rhodesian chrome was to be repealed both on legal and policy grounds. Finally, the question of Portuguese Guinea was to be studied by the National Security Council. Those were the benefits to Africa. US interests were more detailed in the memorandum. No further grants were to be made. No assistance was to be given in negotiating fairer terms of trade between Africa and Europe. But American business was to be assisted in participating in that trade. 1. Promoting US-African Economic Ties. Whereas it seems unlikely that African aid levels will go up significantly or that we can be sufficiently responsive to Africa’s commodity [terms of trade] problems, a greater effort should be made to try to foster a role for American private enterprise in African development. It may be that not much more can be done than is presently being accomplished, but I suggest that consideration be given to the appointment of an Assistant Secretary of State for African Affairs with trade and investment experience. This would show a concern for African development, give a needed push to US exports to Africa (which fell surprisingly in 1972), and further private investment in African minerals and oil exploration as well as in agricultural projects. RECOMMENDATION – That consideration be given to the appointment of an Assistant Secretary of State for Africa with trade and investment expertise interested in fostering economic ties with the developing African states (US-South African economic ties are already strong). Our priorities in Africa South of the Sahara may not rate highly on a global scale but we do have interests and problems on the Continent which merit our attention. Africa South of the Sahara is virtually the sole source of certain products that are essential to US strategic or economic needs: chromite, platinum, tantalite, petalite, gold, long-fibered asbestos, phosphate rock and natural industrial diamonds. Most of these key minerals are found only in white-dominated southern Africa. Africa is also a major source of low-cost [emphasis mine] commodity and mineral imports, including antimony, bauxite, cobalt, cocoa, coffee, copper, manganese ore, pyrethrum, uranium oxide and vanadium. Although sub-Sahara Africa now supplies a small fraction of the world’s petroleum, including natural gas, many countries already offer promise of untapped reserves which will become important as our energy crisis grows. Africa’s resource potential can only climb as the Continent’s unpenetrated interior is surveyed. Both Europe and Japan are most anxious to discover and exploit these resources. US investment in sub-Sahara Africa constitutes less than 3 percent of the worldwide total but it is growing fairly rapidly as we seek to exploit natural resources. South Africa offers naval repair and bunkering facilities unmatched elsewhere in Africa. We have NASA tracking stations in South Africa and Madagascar as well as an important communications station at Kagnew, Ethiopia, and regional communication facilities in Liberia, where we have port and airfield rights in time of emergency. In terms of shipping lanes, the friendly presence of France (at Djibouti) and Ethiopia on the Red Sea are of strategic importance to the United States Navy as is South Africa’s presence astride the Cape of Good Hope. In the Indian Ocean, Mauritius offers port and airport facilities and we are building communication facilities at Diego Garcia. US interests in Africa had been defined earlier in the 1960s. After restating them, the next task of the 1973 Administration was to secure those interests. Earlier discussions in Eisenhower’s Security Council had focused on the problem of dealing with recalcitrant Nationalists such as Nkrumah and Lumumba. Nkrumah was said not to understand or sympathize with American interests—he proposed all foreign military bases be banned from the Continent and claimed the right to co-operate with either Communist or Western countries based on Ghanaian interests. Even Kennedy, who gave African leaders the most latitude, asked why Nkrumah was so hard on them. Justification for Provision of Foreign Military Sales Credit to African Countries in View of their Pressing Economic Needs. African countries do not produce significant amounts of military equipment but they need a certain amount. Their need is rarely caused by potential external aggression. Internal security is the primary security concern of almost all African nations. These internal security needs are not primarily caused by unpopular regimes trying to maintain themselves in power. Rather, they are inherent in the vastly complicated and diverse cultural make-up of each of the African nations. … It would be an error to make a direct one for one link between funds an African nation might expend on military equipment and the funds they have available for economic and social development. By proper use of FMS credits we can help keep certain key African countries favorably disposed toward us. The reader will note FMS credits are the loan instrument which replaced grants of cost-free arms. … The African military is one of the modernizing forces in most African countries by being above tribalism. African military establishments can assist African nations in integrating and unifying their societies. … African military establishments provide a form of training and education which has significant civilian application….the military may provide one of the few means open to this end. Twentieth century industrial concepts are introduced which may otherwise be lacking, for instance, preventative maintenance and managerial skills. The Administration somehow concludes that the sale of arms to strongmen against a background of poor commodity prices would increase stability on the Continent. As discussed elsewhere, stability is the sine qua non for progress. Zaire provides a good demonstration of where an infusion of security assistance over the years has assisted a country in over-coming its dramatic centrifugal forces and has led to a climate which economic and social progress can take place. Moreover, Mobutu personally disposes of perhaps $50 million a year of unaccountable government funds…. Some of this money ends up supplementing military salaries, funding MPR [his political party] activities, or backing worthwhile projects which would otherwise be buried in the bureaucratic morass. But altogether this spending is on a scale that contributes heavily to the growing inflation and could threaten the Congo’s financial stability…. Mobutu’s natural preferences are to build up his armed forces, alleviate the capital’s pressing needs, and strengthen his political party rather than to focus on what he sees as politically less important projects in the rural areas. As a result, 95% of urban Congolese have access to clean water compared to the 31.9% in rural areas, a much bigger gap than in Burkina Faso, Liberia, Guinea, Ivory Coast, Sierra Leone, Uganda, and Nigeria to use a random sample. Only 10.1% of Congolese children are routinely vaccinated compared to 40% of Burkinabe children. Congo’s soaring maternal mortality rate and childhood stunting figures are comparable to those of Liberia, Guinea and Sierra Leone. The relations established on a personal basis, as well as through grant materiel and foreign military sales have provided the US military and through our military the USG with access to certain key elements in some African countries. As grant military assistance programs have been transformed into military sales programs not only have the providers of military equipment benefited, but other US businesses have benefited as well…. Zaire again furnishes a good example. African subjects of dictatorial governments might do well to reflect on the fact that not only are they prevented from associating and speaking in furtherance of their own interests, but survivors must inherit the debt for the instruments of their repression as well. Foreign Relations of the United States, 1969–1976 Volume E–6, Documents on Africa, 1973–1976, Document 1, Memorandum From Fernando Rondon of the National Security Council Staff to the President’s Assistant for National Security Affairs (Kissinger), Washington, January 2, 1973. See FRUS 1958-1960, Africa, Vol. XIV General Policy, Document 21, Memorandum of Discussion at the 432nd Meeting of the National Security Council January 14, 1960. Foreign Relations of the United States, 1969–1976 Volume E–6, Documents on Africa, 1973–1976, Memorandum From the Deputy Assistant Secretary of State for African Affairs (Ross) to the Under Secretary of State for Security Affairs (Tarr), Washington, April 10, 1973. FRUS, 1964–1968, Volume XXIII, Congo Document 100. Memorandum for the Special Group Washington, November 16, 1961. Mary Serumaga is a Ugandan writer. Her essays may be found in Transition (JSTOR), King's Review and Pambazuka News.